A wide variety of birds inhabit the Samaria gorge: it is full of partridges which can usually be found near the springs. Owls, hawks and ravens inhabit the cliffs and there are numerous griffon vultures and the very occasional bearded vulture. Bonelli eagles and golden eagles can also be seen on occasions. The gorge also attracts large populations of migratory birds including turtledoves, quails, woodcock, hoopoes, thrushes and swallows. Numerous small mammals live in it including badgers, polecats and many hares. 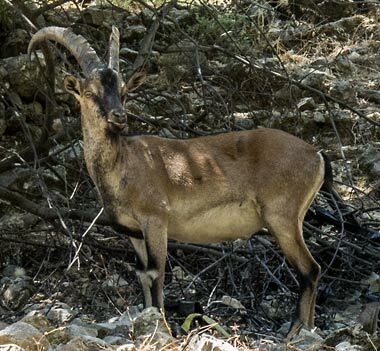 However the best known animal connected with the gorge of Samaria is the wild goat. The Cretan wild goat (Capra aegagrus creticus), also called kri-kri or agrimi, is a ruminant , chestnut brown in colour, with a darker brown stripe running from its neck along the spine down to its tail. The males are larger than the females and have a black beard. The males can sometimes weigh up to 40 kg. The horns of the male are long - up to 80 cm - and quite broad at the base. Along the length of the horns are knobs from which it is possible to tell the age of the animal. The wild goat is extremely agile and when necessary can leap huge distances across gullies and ravines. The Samaria gorge as well as the neighbouring gorges of Klados, Elygias and Tripiti are the last parts of the island where the kri-kris can be found. They are of course a protected species and penalties for hunting them are very high. These protection measures seem to be having some effect and the population is increasing slowly. 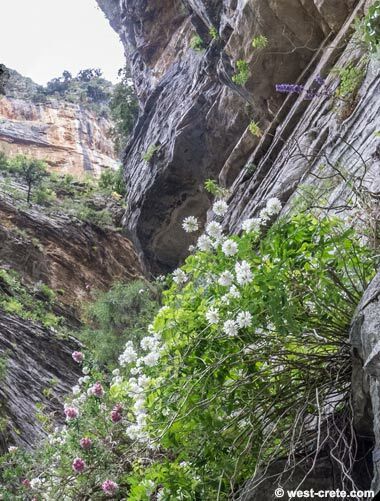 The gorge of Samaria contains a wide variety of species of trees, shrubs, flowers and other plants, some of which are unique to the area. The vegetation consists largely of tall Cypresses, many of them many centuries old, Kermes oaks and Cretan maples in the upper reaches of the gorge. Lower down you find Calabrian pines (Pinus brutia) and Plane trees as well as Oleander and Chaste Tree shrubs. There are also olive trees and groves around the village of Samaria. The gorge of Samaria has played an important role in supplying timber since antiquity and there were a number of water-powered sawmills in it. The medicinal and aromatic plants which flourish on the Omalos plateau and in the gorge are of the greatest interest, consisting mainly of marjoram, savoury, sage and thyme. One other plant is dittany, a Cretan endemic plant which grows in the ravines of the Cretan mountains. It is an evergreen plant with small heart-shaped fleshy leaves, light green in colour and covered with fine white hairs. It is very difficult to collect because it prefers high places, where it grows in the cracks of tall, steep cliffs. It is known for its therapeutic properties: according to the ancient writers, wild goats eat dittany to heal their wounds. Its scientific name is Origanum dictamus or Dictamus creticus. Numerous orchids. Amongst them the extremely rare Cephalanthera cucullata, found near Agios Nikolaos.